Obama's withdrawals were clearly intended to extend indefinitely "and therefore be revocable only by an act of Congress," the judge wrote. President Donald Trump exceeded his authority when he reversed bans on offshore drilling in vast parts of the Arctic Ocean and dozens of canyons in the Atlantic Ocean, a U.S. judge said in a ruling that restored the Obama-era restrictions. Judge Sharon Gleason in a decision late Friday threw out Trump's executive order that overturned the bans that comprised a key part of Obama's environmental legacy. Presidents have the power under a federal law to remove certain lands from development but cannot revoke those removals, Gleason said. "The wording of President Obama's 2015 and 2016 withdrawals indicates that he intended them to extend indefinitely, and therefore be revocable only by an act of Congress," said Gleason, who was nominated to the bench by Obama. A message left Saturday for the Department of Justice was not immediately returned. The American Petroleum Institute, a defendant in the case, disagreed with the ruling. "In addition to bringing supplies of affordable energy to consumers for decades to come, developing our abundant offshore resources can provide billions in government revenue, create thousands of jobs and will also strengthen our national security," it said in a statement. Eric Grafe, an attorney with Earthjustice, welcomed the ruling, saying it "shows that the president cannot just trample on the Constitution to do the bidding of his cronies in the fossil fuel industry at the expense of our oceans, wildlife and climate." 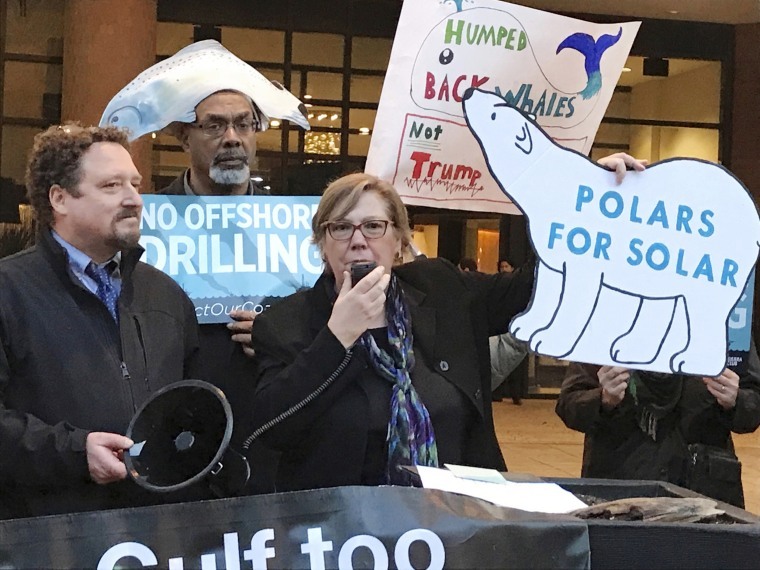 Earthjustice represented numerous environmental groups that sued the Trump administration over the April 2017 executive order reversing the drilling bans. At issue in the case was the Outer Continental Shelf Lands Act. Acting Assistant U.S. Attorney General Jeffrey Wood said during a hearing before Gleason in November that environmental groups were misinterpreting the intent of the law written in 1953. He said it is meant to be flexible and sensible and not intended to bind one president with decisions made by another when determining offshore stewardship as needs and realities change over time. In 2015, Obama halted exploration in coastal areas of the Beaufort and Chukchi seas and the Hanna Shoal, an important area for walrus. In late 2016, he withdrew most other potential Arctic Ocean lease areas — about 98 percent of the Arctic outer continental shelf. The bans were intended to protect polar bears, walruses, ice seals and Alaska Native villages that depend on the animals. In the Atlantic, Obama banned exploration in 5,937 square miles of underwater canyon complexes, citing their importance for marine mammals, deep-water corals, valuable fish populations and migratory whales.